The goal is to have a robot for the Mini Sumo competition (10×10 cm, max 500g), at a lower cost per robot than the existing solution. The robot shall be still competitive, but at a lower cost, so it can be potentially a give-away at events or provided free of charge to students. The Pololu parts are excellent, but increase the price of the robot beyond $150. 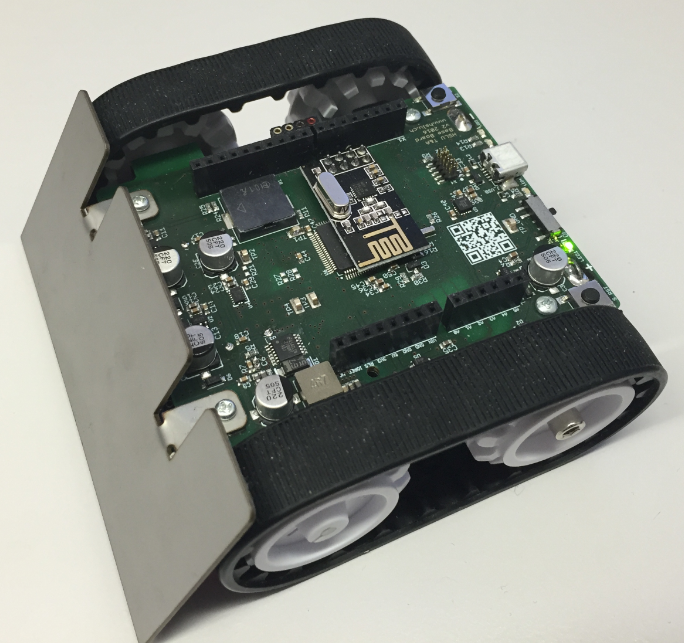 So what we are looking for is a less expensive, but still powerful Mini Sumo robot. The orange JSumo tires are really good, but rather expensive ($16 for a pair of wheels). The default battery is a 3.7V LiPo with an external charger. Optionally, AA batteries can be used too. 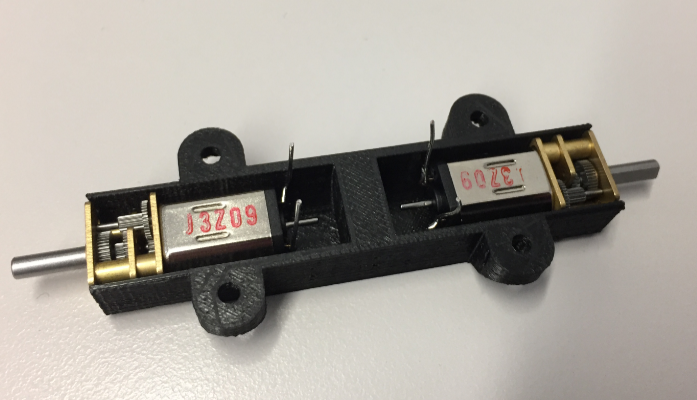 The micro DC motors with attached gear (1:75) fit into a 3D printed enclosure which then is put on the PCB. 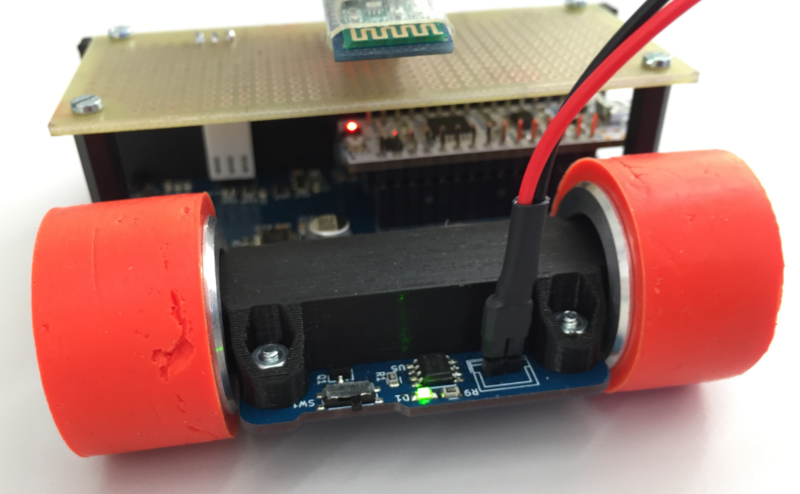 Motors with and without quadrature encoders can be used. The motors from Pololu are rather expensive too: around $18 for one motor. As microcontroller board the STM32F303K8 Nucleo-32 is used with an on-board Segger J-Link interface for convenient debugging. 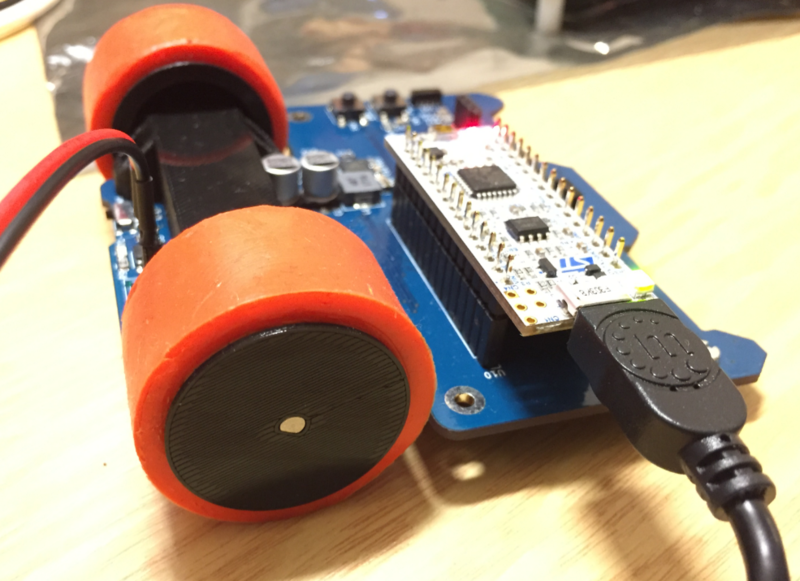 The picture below shows the robot with 3D printed wheels. Potentially we will produce our own Shore-A20 polyurethane tires. On the top side of the board there is a reset button (most likely to be removed, as the Nucleo-32 board provides a reset button already), 3 IR sensors for opponent detection, an expansion header with UART and I2C interface plus a header for the IR sender LEDs. 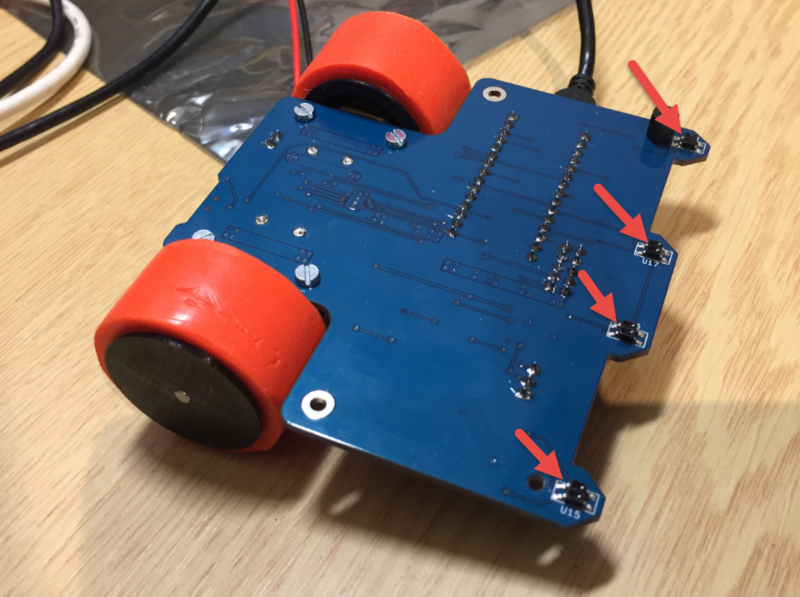 For lower costs, the Nucleo board which only costs $10 can be directly soldered to the PCB. Other microcontroller boards (tinyK20, tinyK22, NXP DIP-800 or other similar boards could be used too. The STM board has been used for the first prototype because it is small, inexpensive and can be debugged with the onboard Segger J-Link interface). The idea is to publish the design as an open source project, so everyone can build it. 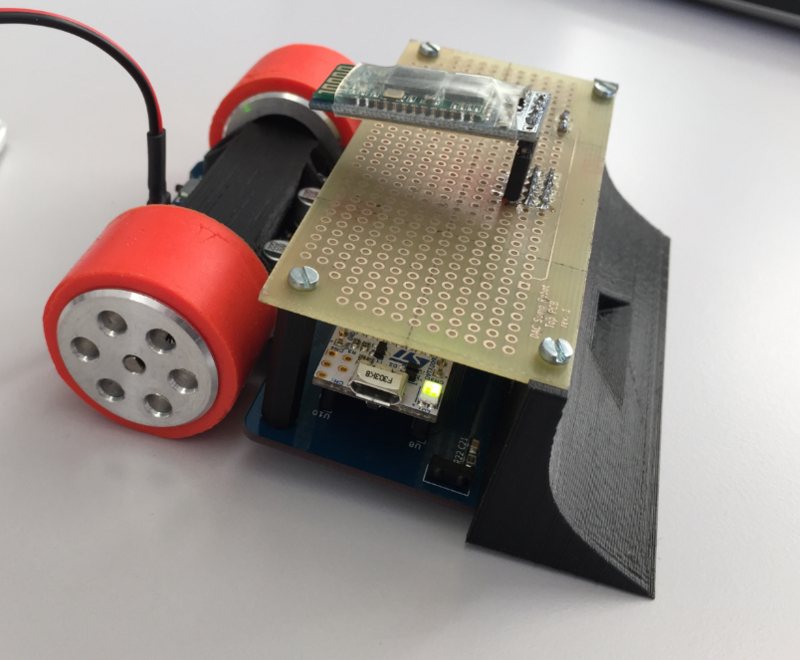 The design has several options (with or without encoders, different set of wheels, custom extensions) so the design could be very much customized, especially with a 3D printer available. The firmware is developed with Eclipse Oxygen and GNU tools for ARM Cortex-M. It uses FreeRTOS V10.0.0 with the McuOnEclipse open source library, so any ARM Cortex-M can be used with industry standard tools. This is the first prototype, and things are looking good so far. I’m currently finishing the basic firmware, and so far things are working very well. There are still things to change and optimize in a next iteration, but I hope we can put the costs around $60-$70 for quantities around 100 robots. 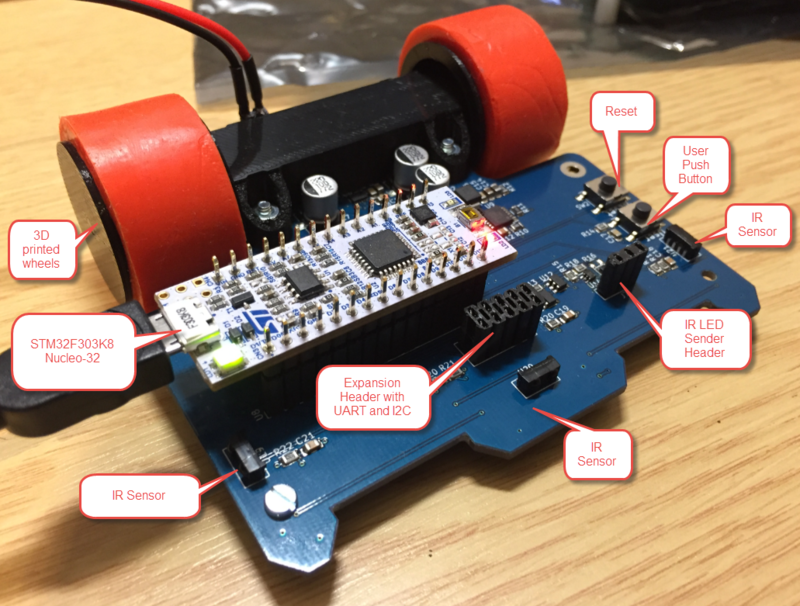 This entry was posted in 3D Printing, ARM, Boards, Building, Cortex, CPU's, DAC Sumo Robot, Eclipse, Embedded, FreeRTOS, gcc, Kinetis, LPC, LPC, LPC800-DIP, LPC800-DIP, NXP, Pololu, Robots, STM32F303, Thoughts, TinyK20, tinyK22 and tagged Building, DAC Sumo Robot, Debugging, Eclipse, FreeRTOS, JSumo, Pololu, Processor Expert, Robot, Robot Chassis, Segger, software, Sumo, technology, Zumo by Erich Styger. Bookmark the permalink. You might still need to 3D print a hub to connect it to motors. Thanks for that suggestion. I looked at skateboard wheels, but they are too hard (usually they have a Shore A value of around 60-80). Much better for Sumo are very soft and sticky tires with a Shore A value of 20. Of course—I forgot that the coefficient of friction is a most important parameter for sumo robots. Are students allowed to coat the wheels with rubber cement or use double-sided tape to increase friction? Formula 1 race cars have coefficients of friction as high as 1.5. Alternatively, you could use the blue tack tape used in some 3D printers to cover your field, and make all the robots have high friction. Yes, the tires can be mofified or custom tires. 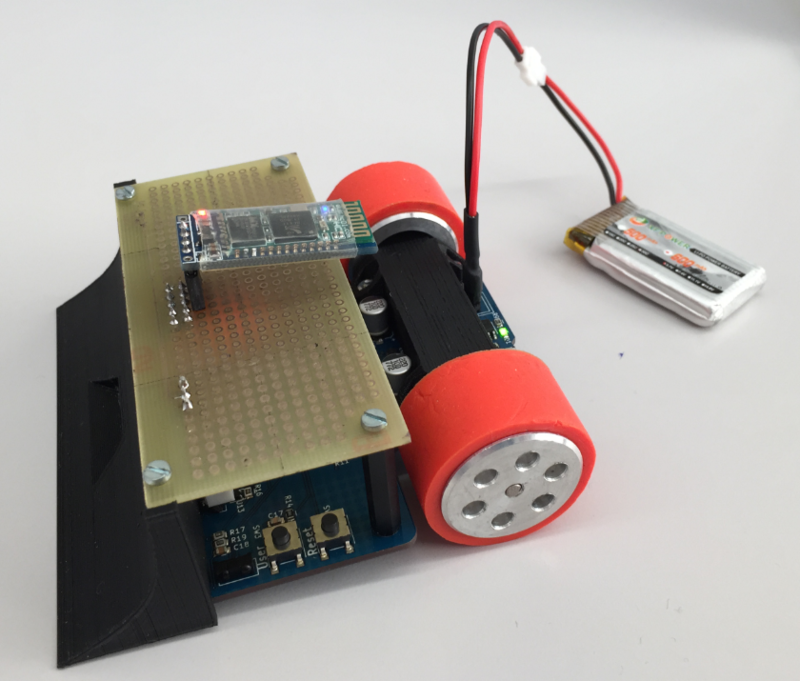 The tires can be sticky, but they have to pass the paper test: the robot is placed on a sheet of paper, and lifting up the robot the paper is not allowed to stick.